Are Sentinel Points Driving You Loopy? 2014 saw the publication of ‘HSG274 - Part 2’ by the HSE, which introduced a slightly different way of monitoring hot water systems. “…the far sentinels are the return legs at a point towards the end of the recirculating loop”. Thus encouraging testing at the true furthest point of the hot water system. The guidance advises that the water temperature at the sentinel points on the main legs of the distribution system should be checked monthly. These legs are referred to as the principal loops. 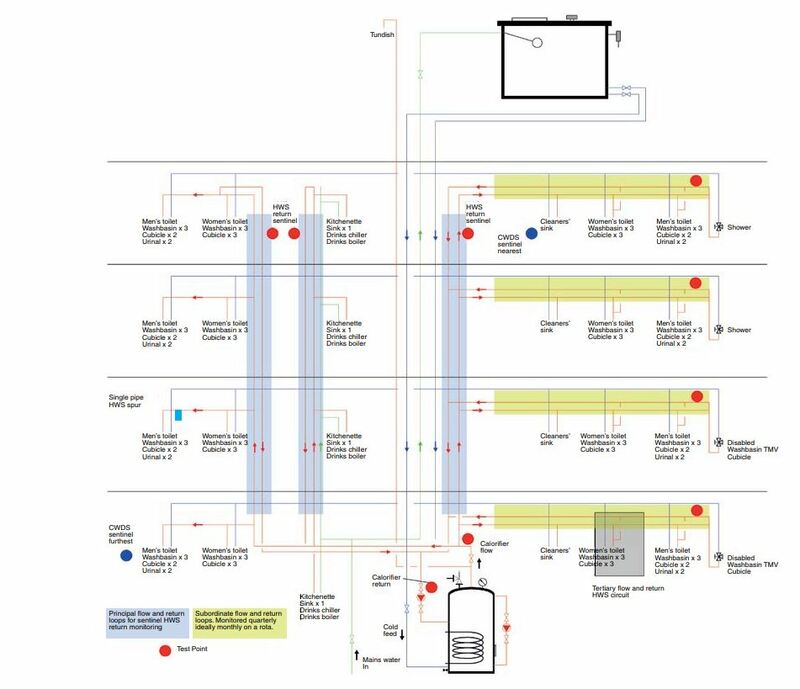 Larger and more complex hot water systems may include additional circuits branching off the principal loops. These are known as subordinate loops. However, we are not done yet! The guidance requires us to go further and identify all of the hot water circuits including those that feed only one or two outlets, these are known as tertiary loops [see figure 2]. Under HSG274 Part 2, the water temperature at the furthest point on each subordinate loop should be tested every three months and a representative number of tertiary loops should be tested on a rotational basis throughout each year. Let’s take a moment to explore our experience of return loop temperatures. 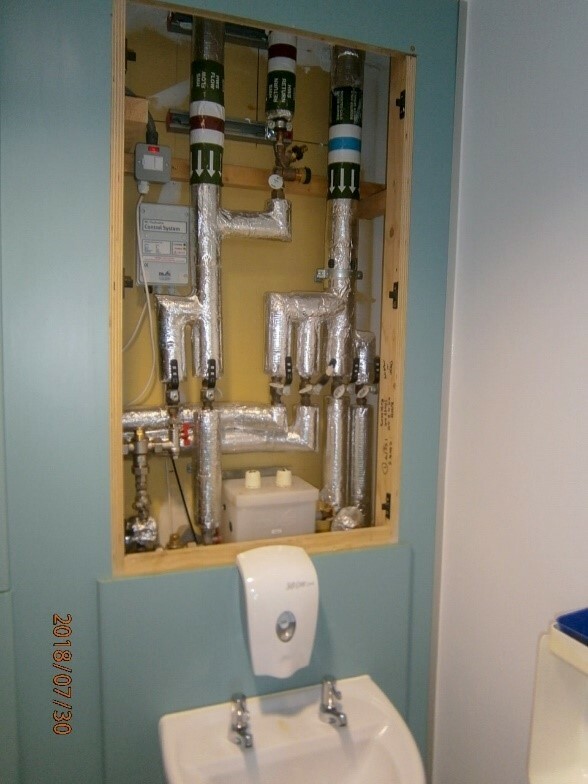 Often risk assessors find that the temperature of return pipework behind an IPS panel, below a hand basin or in the roof space is tepid indicating inadequate circulation or even in some cases no flow at all! The HSE have realised that recirculating hot water systems have the potential to fail in the above, particularly on the return side of the system. Recirculating hot water systems rely on a circulation pump, usually located near the source water heater, that pushes or pulls water around the distribution system. Where these systems have multiple legs, it is easy to see how the circulation may differ between them. Also, where systems have been altered and new loops added, balancing these systems can be a difficult task. In some cases, systems may contain “dead” loops, in which circulation is less effective or even non-existent. This creates zones where the water temperature can fall in to the danger range of 20 - 45˚C. By checking hot water temperatures at the furthest outlet and not at the furthest point in the loop can give you the false indication that the system is circulating effectively. What can really be happening is that the water is being pulled along the system from the source water heater by opening the tap, but as soon as the tap is turned off, the system becomes a “dead-leg” again. The truth would only be known by taking the instant temperature from the end of that recirculating loop. If the temperature is ‘acceptable’, it is assumed that the outlets preceding it will reach the desired temperature within the desired time. In the past four years the Water Hygiene Centre has collated temperature data from ‘tertiary loops’ to review their operational performance. Where practicable, surface temperatures of these tertiary loops were taken before any water was drawn off. This would give a clear indication if a tertiary loop was working and circulating effectively, and not relying on water draw-off. In this small sample, half of the tertiary loops checked failed the test because the temperature of the pipework did not reach 55˚C. Moreover, roughly a third were found to be cold, indicating that hot water was not recirculating at all. In these instances, the hot water system is not recirculating effectively, leading to “dead-legs” that could encourage the growth of Legionella. One of the studies was completed on a newly refurbished hospital ward in which more than half of the tertiary loops were cold. This was after being very recently balanced, checked, commissioned and handed over to the client. ‘HSG274 - Part 2’ has two schematic diagrams showing where these principal, subordinate and tertiary loops are located on two different hot water systems. [see Appendix 2.4 on page 57 and Appendix 2.5 on page 58]. Figure 2 below is one of the examples taken from the HSG274 part 2. Every hot water system is different; therefore, each hot water system will have different sentinel points. It is important that each leg of the hot water system is identified, categorised correctly and that this information is used to inform the monitoring programme for the system. Note that not all recirculating hot water systems will include all three types of loop. Each month, hot water temperatures should be taken on the flow and return to the hot water heater and on each principal loop. In Figure 2, these are indicated by the shaded blue areas. Principal loop temperatures should be recorded from the surface of the pipework on the common return to the water heater. This should be after the point where the flow to the last / furthest subordinate loop is connected. Each quarter (ideally on a rolling monthly programme), a temperature should be taken from each subordinate loop. These are indicated by the shaded yellow areas in Figure 2. Similarly, subordinate loop temperatures should be recorded on the return pipework after the point where the last flow connection to a tertiary loop or outlet has been made. If this is not practicable, subordinate loops may be checked using the last hot water tap on that loop. It should be noted that this may not be the furthest geographical outlet (e.g. the end of a corridor) and could in some cases actually be the closest outlet to the origin of the loop. Lastly, a representative number of tertiary loops should be checked on a rotational basis. These are indicated on Figure 2 as the shaded grey area. In each case, there is no need to run outlets for a period of 1-minute before testing. In fact, the temperature of the pipework should always be greater than 50˚C (55˚C in healthcare buildings), so the temperature is recorded without any additional draw off from the system. For fixed sensors the reading can be taken immediately and for portable temperature measurement equipment the operative should only wait for the probe to reach equilibrium with the pipework. Finding all these loops is no mean feat and will require some working out. Water system schematics, ‘as-fitted’ drawings and a physical check will be needed to pinpoint these locations, especially on complex systems, such as those in hospitals, care homes, schools and large municipal buildings. The most efficient way of doing this is to have up to date ‘as-fitted’ drawings. These will show the exact layout of a water system, showing each loop and outlet. If these drawings are not to hand, then a basic schematic drawing is the next best thing (potentially supplied with a Legionella risk assessment). These will show diagrammatically where each outlet is and where it is fed from. What it probably won’t show is the exact location of each circulation loop, so additional investigation is needed. Once these points are identified, they can then be added to the schematic and temperature monitoring programme. It is important to note that it is outside the scope of a Legionella Risk Assessment to identify sentinel points, just to appraise those already identified. However, this exercise could be tied in with a risk assessment. 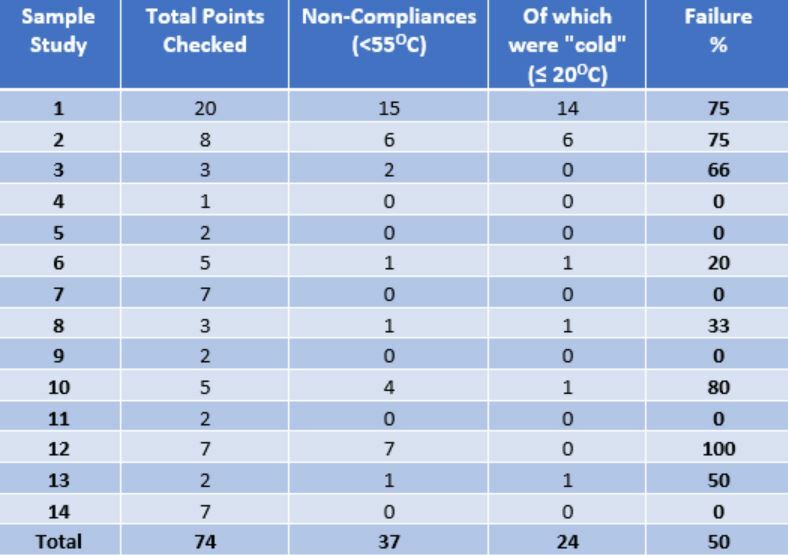 Once sentinel points have been correctly identified, it is argued that fewer temperature checks will be required in total when compared to a programme designed to comply with the guidance pre-2014. Furthermore, as no outlets need to be run before testing, the updated regime lends itself well to remote sensing & data capture systems i.e. 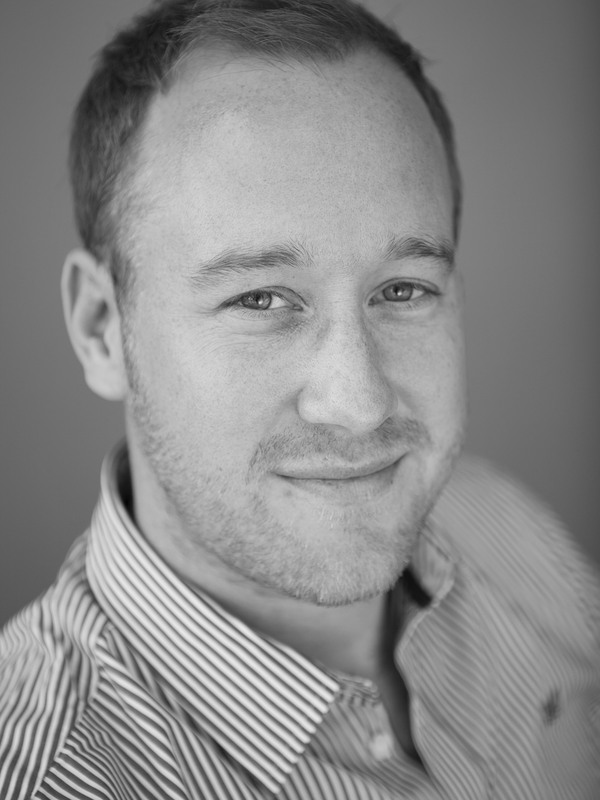 through an established building management system or an independent smaller scale temperature monitoring system. As we have discovered, the HSE have identified a problem relating to the monitoring of hot water systems and the potential for circulation imbalance to cause undetected areas of poor temperature compliance. As such the HSE has given guidance on how to monitor recirculating hot water systems so that circulation issues are readily detected. It is now up to the Responsible Person to ensure that the principal, subordinate and tertiary loops are correctly identified. They should ensure that the associated sentinel points are also identified and monitored to confirm satisfactory hot water temperature performance. If you have any questions about monitoring recirculating hot water systems or the identification of sentinel points, please don’t hesitate to get in touch with Water Hygiene Centre by clicking here.